To the rest of the world, Mo Farah is a track star. In Great Britain, he’s a certified hero. 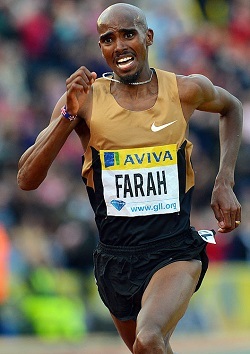 When London hosted the 2012 Summer Olympics, Farah was the home team’s breakout star, winning gold medals in the 5000 and 10000 meters. He then followed it up it up with gold medals in the same events at the 2013 World Championships in Moscow. As Farah prepares for next month’s London Marathon — the first time he’s competed in the 26-mile distance — he recently earned another honor from the country he calls home. Farah, a Muslim from Somalia who has British citizenship, will have his likeness made into the form of wax statues that will be displayed at two Madame Tussauds wax museums in England. “We polled guests to find out which Olympian they wanted to see featured here at Madame Tussauds Blackpool and the response was overwhelmingly in favor of Mo,” said Matthew Titherington, a general manager for the museum, on the Tussauds website. Athletes featured at the Madame Tussauds museum in London are Muhammad Ali, Usain Bolt, Olympic heptathlete Jessica Ennis-Hill, tennis star Rafael Nadal, Olympic diver Tom Daley, soccer stars David Beckham and Cristinao ROnaldo, and cricket legend Sachin Tendulkar. The museum in Blackpool has figures of Beckham, Tiger Woods, Formula One driver Lewis Hamilton, darts champion Phi Taylor, and soccer stars Wayne Rooney, Alan Shearer and Steven Gerrard.